The path of the heat flow out of the enclosure is represented by the general thermal resistance network shown in figure 2. The four vertical walls of the enclosure can be considered a single wall by combining the areas of each wall. The top and bottom walls of the enclosure have to be evaluated separately since the heat transfer coefficient of each is different. Equations 3,6 and 8 are developed in  and are only applicable with air as the flow medium and laminar flow. For most electronic applications the flow within the enclosure will be laminar. 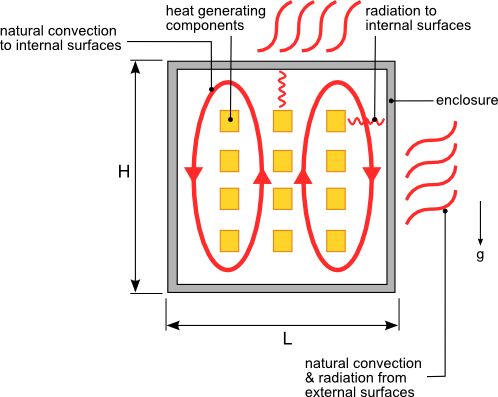 The heat generated inside the enclosure is transferred to the surrounding atmosphere from the external surface of the enclosure via natural convection and radiation. As with convection to the internal surfaces the convection heat transfer from the bottom, top and vertical external surfaces will be evaluated separately. The same convection equations used for the internal surfaces will be used for the external surfaces with Ti-Tis replaced with Tes-Tamb where Tamb is the ambient external temperature and Tes is the external surface temperature of the enclosure. The thermal resistance representing the radiation heat transfer from the external surface of the enclosure to the atmosphere is given by 14. 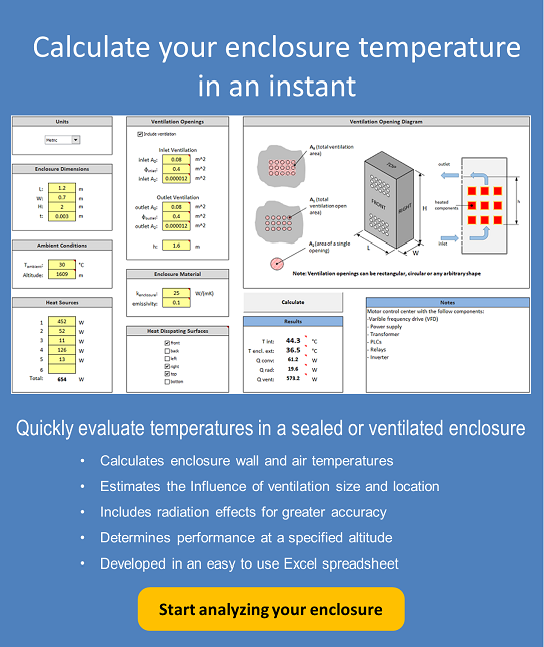 In order to determine the internal average air temperature you must first determine the surface temperature of the enclosure Tes. Tes cannot be solved for directly and will have to be determined using a numerical solver available in any mathematical software or using the “Goal Seek” function in Microsoft Excel. By performing an energy balance at the surface of the enclosure equation 16 is developed. The value of Tes is determined by finding a temperature that satisfies equation 16. With Tes known Tis can now be calculated using equation 18. Note: The thickness of the enclosure walls are assumed to be sufficiently small such that the internal and external surface areas are approximately the same. You are now finally able to calculate Ti using the internal thermal resistances and Tis. As with the calculation of the external wall temperature the internal average air temperature cannot be calculated directly. Ti is calculated numerically by finding a temperature value that satisfies the internal energy balance using equation 19.